Letting a furnished property can be a great way to attract the interest of a broad demographic as well as seek a little bit more in rent than could be justified for a comparable, unfurnished property. 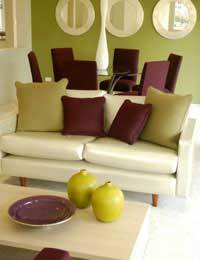 Furnishing a home does require an initial investment of time and money, however, so it should be viewed as an investment. If you are thinking of letting a furnished property first decide if you will offer a fully furnished or semi furnished home. Then decide on a neutral decorating scheme and invest in classic furniture that will appeal to a wide range of potential tenants. If you are short on time then furniture packs might be a great way to furnish your property with minimal fuss. Fully furnished and semi furnished are the two main options for letting a property. Fully furnished means that everything a tenant would need to live in the property is supplied. This includes furniture, soft furnishings, rugs, cookware, dishes and cutlery and appliances. Some landlords also include bedding, linens, television/entertainment centre and wall art or other decorations. A semi furnished home sometimes appeals to tenants who like to bring in their own decor, but still offers a degree of ease in that it supplies carpets, curtains and major appliances. Some semi furnished homes are also let with a minimal amount of furniture. Light or white walls, and paint rather than wall paper. Plain rather than patterned curtains and carpets. While tiles in kitchens and bathrooms. Modern but neutral fittings such as door handles, knobs and taps. Good overhead lighting and/or a selection of basic, bland table lamps. A tidy garden which does not include a great deal of landscape design. Natural wood cabinets and doors. Kitchen or dining room table and chairs. Wall shelving or standing bookcases. Some landlords prefer not to spend their time tracking down separate pieces of furniture for their rental properties and instead turn to furniture packs. These packs usually offer a basic selection of items and often include delivery and even installation in the cost. Some furniture packs are flat pack furniture, but others are a collection of furniture culled from the merchant’s wider selection and offered together as a kind of “starter pack” for any home. Some furniture packs even include electrical goods and soft furnishings like curtains and rugs. Items and prices can vary greatly by retailer, so contact a few before making any decisions. Letting a furnished property can be a great investment for a landlord looking to entice the greatest number of tenants and potentially charge slightly higher rents. Understanding the difference between fully and semi furnished, why neutral decorating schemes are important, what pieces of classic furniture should be offered and how furniture packs can help are all important for landlords considering furnished rentals.